Perfect Timing: America is About to Make King David Very Proud! - Breaking Israel News | Latest News. Biblical Perspective. Perfect Timing: America is About to Make King David Very Proud! Nearly 3000 years ago, in a landmark achievement, King David established Jerusalem as the capital of Israel. Throughout history, ever since the Holy Temple stood in all its glory, through thousands of years of exile and until today, Jerusalem has remained the eternal capital of the Jewish People. Once again, Jerusalem history is in the making. And to many, this is another example of the fulfillment of Biblical prophecy. For the first time in over 2000 years, a world power will recognize Jerusalem as the eternal capital of Israel – and in a most dramatic way. This is historic! When candidate Donald Trump made a campaign promise to move the US Embassy to Jerusalem, many were skeptical. They wondered: Was this just another candidate’s attempt to gain the pro-Israel vote? On June 1, 2017, several months after President Trump’s victory, he signed the waiver to avoid moving the embassy, as had been done for decades by former presidents. Six months later, on December 6, 2017, Trump said that the US will formally recognize Jerusalem as the capital of Israel, reversing nearly seven decades of US policy. He then ordered the relocation of the US embassy to Jerusalem. The move was expected to take years, but then came the shocker: On February 23, 2018, Trump announced that the US will move its embassy to Jerusalem in less than three months, on May 14, 2018. The date coincides with the 70th anniversary of the creation of the State of Israel. The timing was perfect – couldn’t be better! The US is sending a massive delegation to Jerusalem to honor the occasion, completing the process of formal recognition of Israel’s capital. Indeed, nearly 3000 years later, King David would be very proud…. 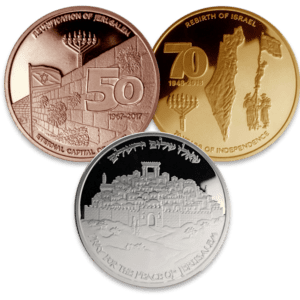 To mark this historic occasion and to ensure that this modern-day miracle will be forever be remembered, the Jerusalem Mint has issued a limited edition set of commemorative coins, known as the Jerusalem Embassy Collection. The coins will be awarded to President Trump and Prime Minister Netanyahu for their extraordinary role in the momentous event. 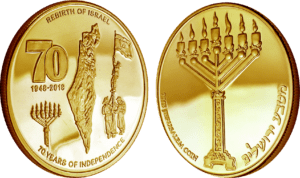 The Israel Independence Coin, featured in the collection, is a magnificent reminder of the fulfillment of biblical prophesy with the rebirth of Israel on May 14, 1948, as well as the US’ formal recognition of Jerusalem as Israel’s eternal capital. Also included in the exclusive collection, the Jerusalem Jubilee Coin pays tribute to 50 years since the reunification of Jerusalem following the Six Day War. Amazingly, the US embassy move coincides with the first month of Israel’s celebration of 70 years of independence and the final month of Jerusalem’s celebration of 50 years of reunification. The Jerusalem Peace Coin, depicting the majesty of ancient Jerusalem and the Holy Temple in all of its glory, is the crown jewel of the magnificent set, as the words “Pray for the Peace of Jerusalem” ring the exquisite artwork in both Hebrew and English. It is no wonder that the Jerusalem Embassy Commemorative set is nearly sold out! Indeed, the people of Israel and the US are optimistic that the historic recognition of the Israeli capital and the moving of the embassy there will usher in a new era of peace, to the City of Peace, Jerusalem. The timing simply couldn’t be better. Click here to view the collection and own a piece of history.